The Elsa is starting to look like an Elsa. It’s very exciting to see a costume begin to take its final form, and this time is no exception. 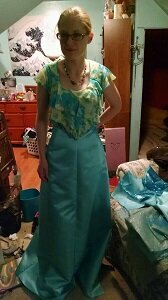 Once Lizzy and I got the pattern cut and started pinning pieces together, it was quick work getting the skirt and bodice together. The skirt is rather long, but that’s good news. 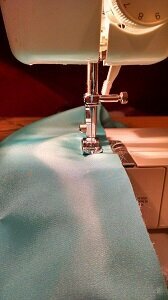 I would rather hem the skirt than need to start over, buying more satin. 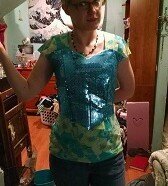 Even though it is long, it will fit over my hips perfectly. The Medium was definitely the right choice. 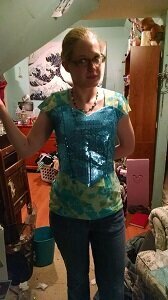 The Medium, however, was not the right choice for the bodice. There’s basically a full extra panel back there. Too much room for the natural waist and the bust, so it’ll have to be taken in. This bodice was a million pieces. 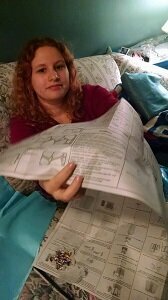 OK, I’m exaggerating, but look how many pieces that was. Stitching it so the seams didn’t look wonky was a bit tricksy. I love this pretty satin skirt. It’s so shiny! We’re getting there! 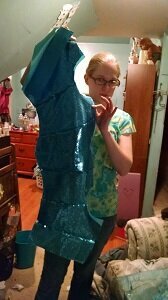 This week, we will be playing with all of the stretchy glitter blue mesh for the sleeves and overlay. The glitter is going to get everywhere. It is the STD of arts and crafts, after all. It’s its job. Before we know it, the finishing touches will be made, and this Elsa is going to be Halloween-ready! !